Sparkly jewelry? Check! 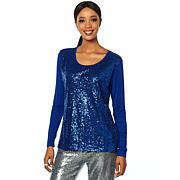 Sparkly tops? Here you go! Joan's tank duo lets your clothing dazzle all year long. Break it out in spring and summer to give warm-weather looks some sizzle. Layer it with fall and winter cardigans and such to give cool-weather getups an icy flash. Just pick the color that suits your outfit, and get dressed for sparkle season. I liked the look and feel of this two pack and got the black and grey. The sequins are a nice touch under anything or alone. The fit is good. These tops are perfect. Im 55 34DD, 130 lbs and the XS fits me. I got the tan/black combo. I cant wait to wear them. Great quality and style. Thanks Joyce! Love this in the grey and black combo and I dont even like sequins! This design adds just enough to be classy. I love with the white jean jacket. Itll look great anytime of year. Just like the jacket, I sized down to medium and I wear a 40D bra. Keep it casual and cool on sunny days with this built-in bra tank top. Pair with a breezy skirt, sandals and a UV protection wrap for the perfect fun in the sun ensemble.